2) Customer logs in on the kiosk and posts the picture (with your logo and branding) to their Social Media site! 3) Our Software converts them to a FAN on Facebook, Follower on Twitter or a Check-in on FourSquare! 4) You continue to market to your customers through your social media sites! Kiosks are for Rent and For Lease! From Redding to Reno / Tahoe to the Bay Area to Los Angeles and everywhere in between! 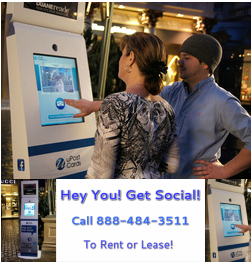 My Social Media Pro maintains an inventory of Rental Kiosks for any occasion! If you have a business with high volumes of foot traffic, you'll want to capture "in the moment" testimonials from your customers! Having a kiosk at your place of business will allow you to build your social media while providing an interactive activity and commemorative photo! If you have a mall, bar, nightclub, casino, airport or any business where people are, our Kiosks will help you learn more about your customer! If you are having an event, attending a trade show or vendor opportunity, sponsoring an event or just want to know more about your community, our kiosk is for you! We brand the photos to you, make sure we build up your social media following and help you gain added exposure! As a BONUS, people will wait in line to get their picture taken because everyone loves photos! HERE ARE SOME SAMPLE PICTURES!